Weekend Writing Warriors is a blog-hop taking place every Saturday, co-ordinated by http://www.wewriwa.com/. Click through to the WeWriWa site to see a list of participants.In it, authors share only eight sentences from something they’ve written or are currently working on. I'm participating this weekend! “Have you ever danced next to a river?” His voice was deep again, husky and excited as he shifted her in his arms. It perked her body up, sending blood rushing to all the right places. The feeling that filled her was like a spark that spread flames throughout her body, keeping her warm despite the cool night. “Well, do you have one more dance in you?” He asked, as he started a slow, gentle Foxtrot, sweeping her up in it. 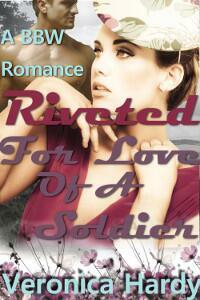 Riveted: For Love of a Soldier is now available! Purchase it on Amazon, All Romance, or Smashwords .